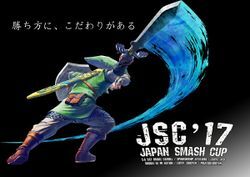 Japan Smash Cup 2017 (or 2nd Tokai) was a national Smash 64 tournament held on May 6th, 2017. There were 39 entrants, and Top 8 was streamed live on Nico Nico. It featured 6 groups named A-F where the top 3 would advance to best-of-3 double elimination bracket with best-of-5 grand finals. The groups were drawn without seeding leading to top players Fukurou, Kurabba, Maha, Shizuku, Gyaki and Nangoku being all in the same group. This page was last edited on September 30, 2018, at 06:16.